As you may have already noticed, during the last months there isn't anything new written here by me. This is mainly due to two reasons: 1) lack of free time due to new responsibilities in my company and 2) most of my writing happens in our internal wiki (almost 200 "docs" during the last 12 months!). On the other hand, there are a lot of "new" things happening in the internet, one of them being the IPv6 "paranoia". Since we have made IPv6 be a strict requirement in my company for any new product evaluation during the last 2 years, one of the things i'm trying lately to calculate is the size of the IPv6 BGP routing table in the forthcoming years. Geoff has a diagram showing the size of IPv4 BGP table from 1994 till today. 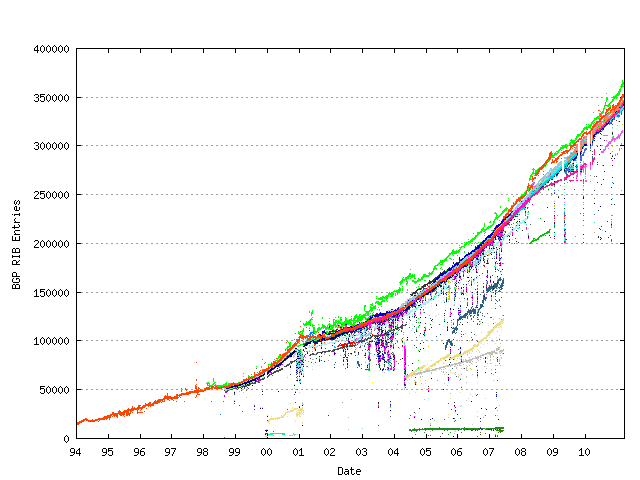 As you can see, it started at ~20k in 1994 and has reached ~360k in 2011. 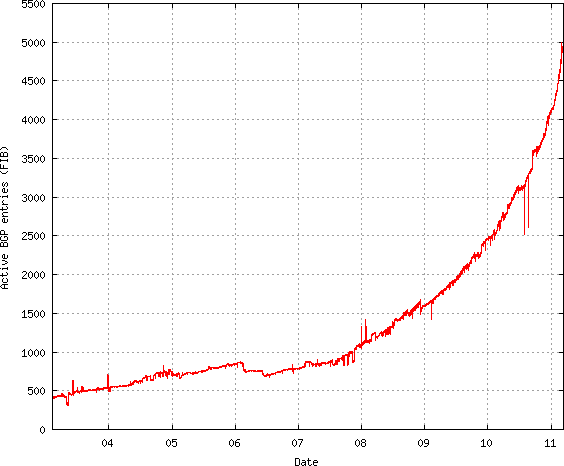 Imho, it's too risky to believe the same trend-line will also be used by IPv6. 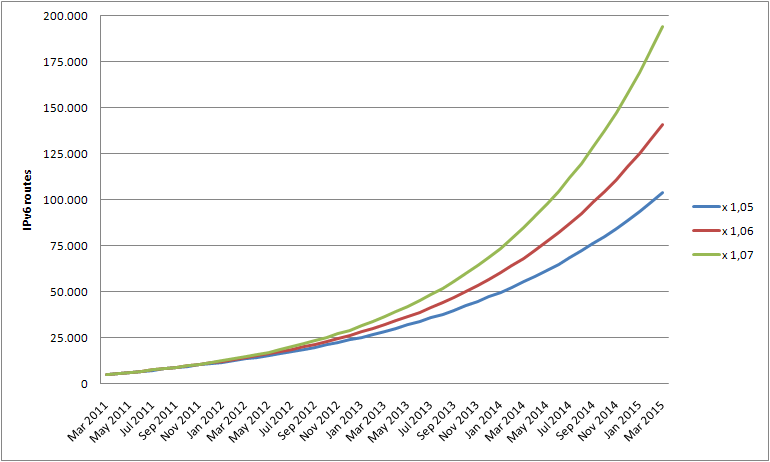 I expect IPv6 to have a higher rate and a sharper curve, especially in the next 2 years, where IPv4 will probably lower its increase rate. The only thing that can stop this is a translation method that works for everything (current translations have a lot of issues). If such a thing doesn't appear soon (lately, IPv6 related RFCs are being updated/published/expired quite frequently), everyone will soon or later try to move to IPv6, meaning more routes in the global IPv6 BGP table. 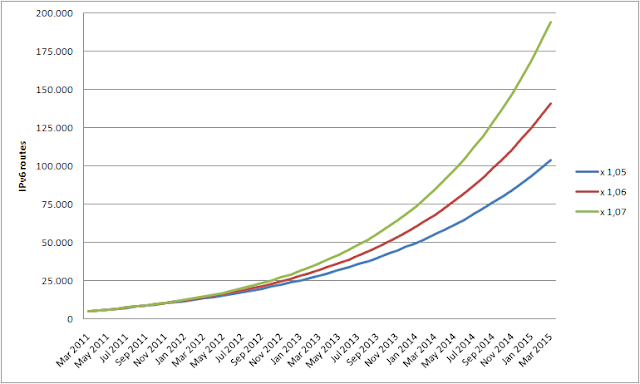 Currently, the IPv6 BGP table has ~5k routes, but the potential for rapid increase seems quite promising. As you can see in the following diagram, the IPv6 table has near-doubled its size during the last year and 2011 started quite aggressively. Based on the above diagram, one could suppose the increase will continue to happen on the same rate during the next years too. Another approach is based on the number of prefixes that each ASN announces. The average in IPv4 is a steady ~10 prefixes per ASN all these years (currently there are ~37k IPv4 ASNs and ~360k IPv4 routes). The average in IPv6 is 1.4 prefixes per ASN (currently there are ~3.5k IPv6 ASNs and ~5k IPv6 routes), but that might change soon. Another thing to keep in mind is the average prefix size in IPv6. It started as ~/33, had many up-downs and it has now reached ~/38. This will probably keep on showing this up-down behavior, but in general i expect a small increase as time passes by, for the reason i explain below. Also, having as a reference the IPv4 diagram, where it has stabilized somewhere above /22, i expect the IPv6 one to stabilize around /44. IPv4 didn't have a competition and/or push from another protocol all the past years, so its increase was based solely in the number of new networks being connected to the internet. IPv6 has to support all current IPv4 networks in a shorter time-frame that IPv4 did (the translation case applies here too), plus all the new ones that are coming out due to more devices getting connected to the internet. This of course doesn't necessarily mean more IPv6 prefixes in the BGP table. A /32 is usually what a provider gets these days when asking of IPv6 space. And although a single /32 announcement could probably cover all routing needs of the provider, this is difficult to happen in reality. The usual interconnections between providers are based on multiple 10 Gbps or 2,5 Gbps links. In order to distribute the /32 traffic among all of them, something must be done in terms of traffic engineering; split the /32 in multiples of /40,/48, etc. (imho, a IPv4 /24 is like a IPv6 /48 in terms of network announcement; most providers will filter anything smaller). Currently this isn't needed, because IPv6 traffic is minimal, so a single 1 Gbps link is more than enough. But in the near future, a 10 Gbps link won't be enough to service a provider's /32. Meanwhile, 40 Gbps and 100 Gbps are around the corner. I don't know if these will become a commodity before IPv6 traffic explosion. 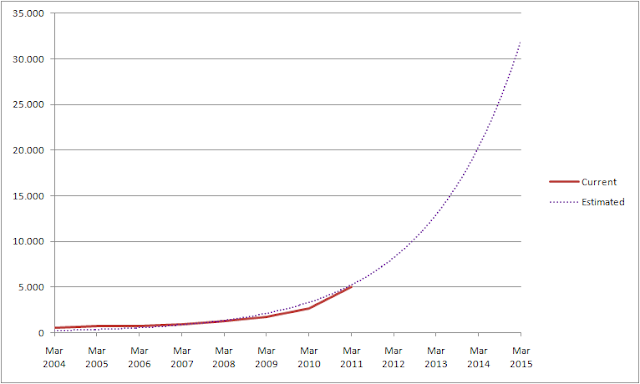 If yes, we might see IPv6 table increasing in the beginning and decreasing after a while. Regarding vendors, the things are quite complicated as usual. Here is the information i managed to gather about IPv6 routes capacity (FIB), based on the available info on the internet. Note : These have not been verified by the vendors. If you have any other numbers, please inform me. Also, before taking into account the above numbers, you should remember that dual-stack will consume IPv4+IPv6 space (future IPv4 estimations talk about 500k routes) and some of these numbers might be hardcoded, while some other are configurable. A linear scenario starting from today would be the following, which would leads us to ~29k IP6 routes. Some "exponential" scenarios starting from today would be the following, which would lead us to ~104k/141k/194k IPv6 routes. Lastly, an exponential scenario based on past utilisation would be the following, which would lead us to ~32k IPv6 routes. Personally, i would feel very safe with ~125k IPv6 routes until 2015. I would even risk for ~50k. Anyway, i believe it will be much easier to predict in 2 years from now. 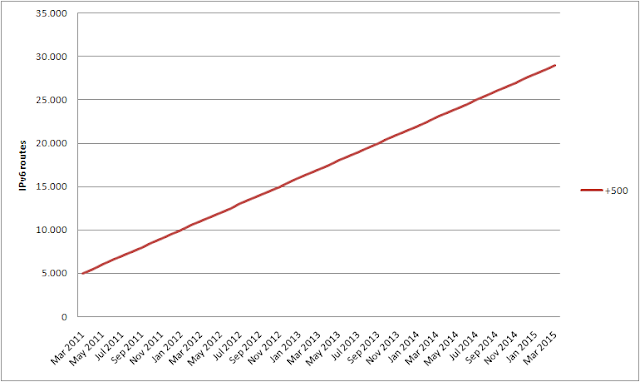 As a last note, i have added a poll to the right regarding your estimation about the IPv6 BGP table in 2015. Please feel free to submit your vote. Cisco 6500 route capacity is from a shared memory where IPv4 and IPv6 both exist and not as high as listed above if you run both protocols. The same applies for almost all mentioned platforms ;) And most vendors do not provide mixed numbers. I just tried to gather the max number of IPv6 only routes. For AlcaLu 7750 is 512K for IPv6 FIB (they are using RADIX compression, so that is the minimum value, can grow high). It is not shared with IPv4. This is based in IOM-3 hardware (it's been in the market for more than 18 months now). Thx for the info. I have updated my post.